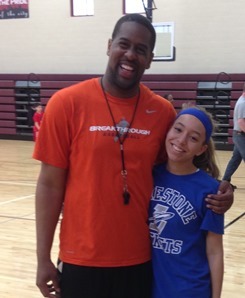 Breakthrough Basketball Shooting Camp in Canton, Michigan! With this 2 day camp in Canton, Michigan your shooting percentage will go up, your mechanics will improve, and your shooting range will increase! In addition to all of this, we will focus on confidence, mental toughness, hard work, smart work, and other intangibles to develop great shooters. Quentin was all conference in high school and a McDonald's All-American nominee. He went on to play at Western Illinois University where he holds the records still today for for most 3 point field goals in a game (9), most consecutive games with a 3 point field goal (6), and highest 3 point field goal percentage in a game going 9/11 for 82%. Assistant varsity coach at Redford Covenant High School in Detroit, Michigan. Responsibilities included practice planning, organizing game plans, scouting and team development. Otherwise there is a $97 fee to attend as an "observing coach". You will get to learn new drills and techniques from Quentin Mitchell, just like all the players and other coaches in attendance. Visit this link to reserve your spot as an observing coach. If you have any questions, don't hesitate to email us or request a phone call.